It’s time for something a little bit specialised today. One for the real beer nerds. If you’re interested in training for a career in beer, or if you’re a home brewer, this is for you. When you’re training as a Beer Sommelier or Cicerone, developing your palate is extremely important. It’s your main tool after all, so best keep it sharp. This means tasting lots of beer, which is usually no hardship, but you have to take the rough with the smooth. You need to cover the whole spectrum of flavours out there rather than just concentrating on the more pleasant ones. One of the jobs of a Beer Sommelier is to recognise when something is wrong with a beer. We have to know which aromas and flavours are undesirable in a beer and what causes them. To learn this you need to seek out bad beer. You can’t rely on finding these flavours in the wild. Bad or tainted beers do exist and are sold of course, but you only find out the beer’s bad after you’ve opened it or after it’s been poured. So, there’s no way to know in advance where to seek out a particular off flavour. But you need to build up familiarity with these flavours through frequent and repeated exposure to them. What’s an aspiring Beer Sommelier to do? You can create some of these flavours at home (more on that later) but the most reliable way to learn is to use flavour kits to spike beers in order to recreate the desired off notes. This has the advantage of allowing you to focus on a single aroma in isolation so you can really learn to recognise it. You can buy these kits online – eg from Aroxa – but they’re not cheap. Each one comes with vials or capsules of concentrated flavour chemicals that you need to dilute in beer. Something bland is best, so it won’t interfere with taint you’re trying to get familiar with. An American adjunct lager is best here. Off flavour sessions are the one time you’ll find beer nerds actively seeking out Coors Light! Tasting sessions like this are best done in a group. The flavour spikes are generally packaged in amounts suitable for dilution in one litre of beer. It’s important to work at the right concentration so you’re not working with a flavour that’s too strong or too weak. One litre of this bad beer is enough to make up tasting samples for ten people. If you’re rich enough you could just take what you need and pour the rest down your solid gold sink. Or sit there dutifully slogging through the lot on your own, sticking two fingers up to wastefulness. But really, why would you? Most people want to work through more than one flavour in an evening. The pouring and mixing for all this can get pretty tedious if you haven’t got someone to chat with – or better yet someone to share the work with. These are just a couple of relatively minor practical matters. There are even more important reasons why it’s better to work in a group. It’s useful to compare notes with others after your initial assessment of the samples. Discussion here is vital and can make all the difference between fixing that flavour firmly in your mind or feeling vague or uncertain the next time it comes around. When I was training for my Beer Sommelier accreditation, I had a hard time fixing the flavour of trans-2-nonenal in my mind. It’s an off flavour produced by oxidation that’s often described as being like paper or wet cardboard. I came across it a few times in tasting sessions and couldn’t always pick it out. One evening I was at an off flavour session where someone mentioned that it always reminded her of the taste of envelope glue. Suddenly a connection was made, and ever since then I have been able to pick it out from a mile off. Most importantly, working with others is invaluable when you come up against a sample that you just can’t taste at all. It could be that you’re just having a hard time recognising the flavour. Being able to chat with others who are smelling/tasting the same thing can help you recognise it. It’s much better to sort this confusion out right away. Tasting in a group is the only way to do that. But if you’re definitely tasting nothing, it could be that you’re ‘blind’ to certain flavours. And again, if you’re alone it’s much harder to confirm this. Flavour blindness is a real phenomenon; we all have different sensitivity thresholds to different flavour compounds. There are plenty of people who can’t detect DMS for instance – even in the brewing and beer judging worlds. It’s not a major problem as long as you recognise it, and are able to let others know if you’re in a situation where the ability to smell DMS is important. You’ll need a space where you can spread out. There will be lots of cups, empty beer cans, and empty capsules. Plus each person needs room for all their samples and also room to take notes without worry about knocking anything over. You’ll need space for a water jug, water glasses. Perhaps even for crackers if people want to cleanse their palates between samples – though this isn’t always strictly necessary. Your venue needs to be free from distracting smells. Ideally free from distracting noises too. You don’t need total library-like silence but you need to be able to discuss all these horrible flavours that you’re about to subject yourselves to. And lastly you might want to be able to make up the spikes in a different area to where people are tasting them. This is especially useful when people want to taste their samples blind. It’s easier than you’d imagine to give people inadvertent hints to which flavour you’re mixing up before they’ve had a chance to taste and assess it. Also, it’s best to avoid smelling the undiluted samples. At the very least, you should allow people to avoid it if they wish. The first thing to do is dilute your off flavour to the correct strength. Use too little beer and the spike will be overpowering; too little and you won’t detect it at all. Once that’s done, pass the samples around and get sniffing. You probably know the drill by now, but if not I have a post on proper tasting and evaluation technique that will sort you out. It’s usually best to have one person acting as group leader. They lead the discussion and can have notes about each flavour to hand that can be read out after the samples have been tasted. They can also keep people in line so there’s no chatting until everyone has had a chance to assess their sample for themselves. It’s important to assess your samples in silence first to avoid colouring anyone’s first impression. When everyone is ready, discuss and sample again. Keep on revisiting your sample as much as you need to while the discussion goes on. It’s amazing how much what you hear can affect what you’re able to taste, and if you’re going to fix that aroma and flavour sensation in your mind for good this is when it is most likely to happen. If you can, it’s good to keep some of each sample back throughout the tasting so you can compare and contrast them with other flavours, to help get your head around them. But it’s not necessary, and sometimes there’s limited glassware to hand, so it’s good to have the option to dump and rinse your glass before reusing it. It’s a good idea to limit yourself to about six flavours in a session. Beyond that you can get overwhelmed. You’ll do yourself no favours if things start to get muddled in your mind. The idea is to build up a clear and distinct memory of each flavour to aid future recognition. Take it slow and lay down the right pathways in your mind – much easier than trying to fix a muddled recollection later on! Just crack open a bottle of Heineken and sniff at the neck, then you’ll know what this one’s all about. I won’t go into exhaustive detail here, but I’ll give you an overview of the main off flavours you will need to recognise if you want to become a Beer Sommelier or Cicerone. This ester is only really considered an off flavour if it’s present in too high a concentration. It smells of green apples or emulsion paint, with a solvent like character. It’s caused by incomplete fermentation, or over oxidation in cask where it’s a precursor to the cask going off. The smell is buttery, butterscotch, cinema popcorn. It’s I Can’t Believe It’s Not Butter. It also causes a distinct and recognisable slick mouthfeel in the beer. This one is caused by incomplete fermentation. Either the brewer took the yeast off too quickly or the fermentation temperature was not high enough. It can also result from lactic acid bacterial infection. This is a desirable flavour (up to a point) in some beers, particularly pilsners. Smells and tastes like sweetcorn, or canned tomatoes; described as vegetal. This one is present in all beer at some stages of the brewing process, but is usually reduced to below detectable thresholds by the time you come to drink it. It forms from malt-derived precursors and burns off quickly during the boiling stage of brewing. If you’re tasting it, either the brewer didn’t boil their beer for long enough, or they allowed the wort to get too warm after boiling and so DMS built up again. DMS is a desirable characteristic in some pale lagers and ales, particularly Czech pilsners (but not German ones). The precursor is more present in pilsner malt than it is in British malts, because the malt undergoes less modification before brewing. Also known as skunked. 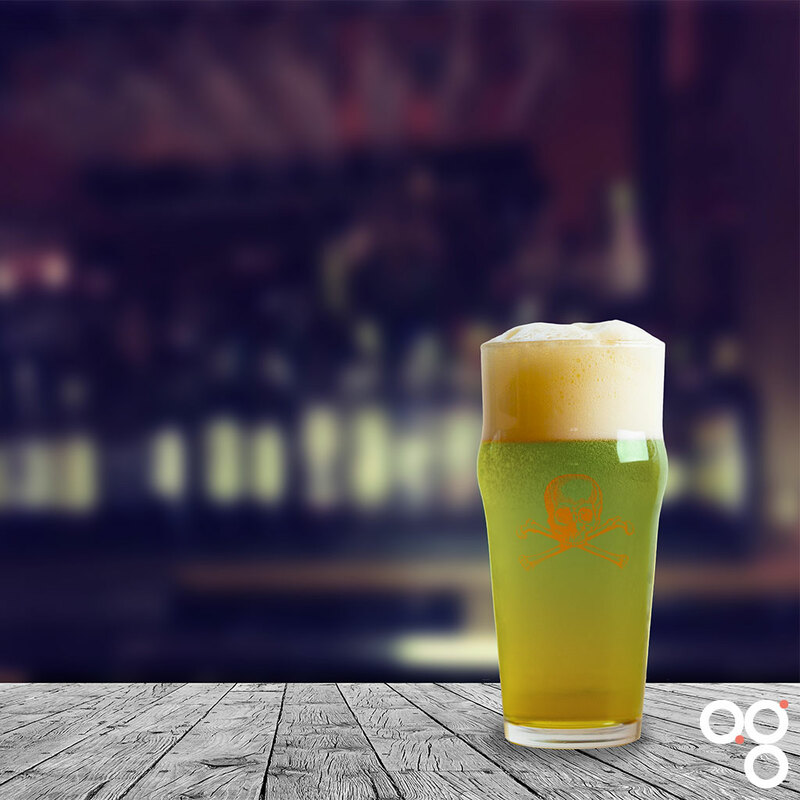 This is an off flavour related to exposure to UV light, which reacts with hop-derived compounds in the beer to produce chemicals that are also present in a skunk’s spray. It also smells like weed. I’ve heard this described as ‘like freshly-brewed coffee’, which just makes me wonder what sort of coffee those people are drinking! That’s not a description that works for me. Just crack open a bottle of Heineken and sniff at the neck, then you’ll know what this one’s all about. This is the one that’s papery, or like wet cardboard, or licking envelopes. It’s caused by oxidation (or specifically the breakdown of malt derived lipids). It’s most commonly found in aged beers but can also occur in improperly purged cans. Pasteurisation can exacerbate this fault. You can read more about light strike and oxidation – plus how to avoid them – in my posts on storing beer and ageing beer. More of an aroma than a flavour, although there is a faint licking-a-penny quality that comes through. The best way to confirm the presence of this one is to dip your finger in the beer and rub a bit of it onto the base of your thumb. Let it dry for a second then smell: if this contamination is present then your thumb will reek of metal. This one is caused by by contamination from poor quality metals used in brewing process. You shouldn’t see it these days really, as nearly all breweries use food grade metal. You won’t get it from cans as these all have coatings inside to stop the beer from touching the metal. You might get it in home brew beers however. You can create some off flavours at home. I have to say though that – apart from the light struck one – these methods are not really ideal, or all that reliable. If you’re taking your Sommelier or Cicerone training seriously you really ought to use the proper flavour kits. What follows is more useful for a bit of supplemental fun, or as a way to dip your toe into the water to see how you do. Light struck is the easiest one to attempt. Take a suitably hoppy beer and pour it into two glasses. Keep one somewhere dark and put the other out in the sun for 10 or 20 minutes, then compare the two. If you want to recreate oxidation it’s less guaranteed, but you can have some success with the following method: take two cans of the same beer. Keep one in the fridge. Put the other in a pan of hot water and simmer it for about five minutes. (Gently please! We don’t want exploding cans.) Put this one in the fridge to cool – remembering which beer is which – and then compare the two. The heat should have exacerbated some of the natural oxidation in the beer causing it to taste noticeably stale. For DMS, open a can of sweetcorn, or chopped tomatoes, and sniff. Some people also say they get this from baked beans. I’m not so sure myself. For diacetyl, try spiking a beer with fake butter flavouring. Again, this isn’t an exhaustive list. This is an ester produced by both ale and lager yeasts. It produces aromas and flavours of red apple, aniseed, and liquorice. It is a key flavour note in some beer styles. (Somewhat annoyingly my notes didn’t say which ones!) It gives a distinct apple aroma that is fuller, sweeter and more rounded than the green apple note of acetaldehyde. Another ester produced by both ale and lager yeasts – although it is more common in ales, especially in German wheat beers. It smells of banana, bubblegum, and pear drops. This is present in all beers but not usually at detectable levels. It can be produced if the yeast is stressed, so if this is appearing where it’s not wanted it may indicate that fermentation took place at an incorrect temperature. This is often confused with ethyl hexanoate and ethyl acetate. Talking of which… This one is fruity, solvent like, smelling of nail polish remover in high concentrations. It’s an ester that can be produced when yeast is stressed. The aroma is reminiscent of solvents, marker pens, and PVA glue. This phenol is spicy: think cloves, cinnamon, nutmeg, and vanilla. (It’s not to be confused with 4-vinyl-guiacol, which is the phenol giving pure clove notes.) Eugenol can occur as an off-flavour in lagers. In other beers, particularly Belgian ales, it can function as an important ‘flavour impact character’. When I’ve tasted this I’ve found it very restrained on the nose and most readily recognisable only in the aftertaste, as a mild spiciness on the palate. This is an essential oil that comes from hops, imparting a floral note or in higher concentrations the aroma of rose petals. It smells of roses, Turkish Delight, and granny’s perfume. Of course the real challenge, once you’ve become familiar with these flavours in crappy lagers, is then to recognise them in more flavourful beers where they’re competing with hop aromas, esters, and other flavours. This isn’t a learn-it-once-and-it’s-done kind of deal. Even if you can spot DMS at fifty paces in super hoppy beers. This will be an ongoing process, with constant refreshers needed over your career as a Beer Sommelier or cicerone. As ever, the key is to constantly taste and smell in a mindful way. Paying attention to the flavours and aromas you encounter day in day out as part of your daily life, along with these more deliberate and targeted exercises, will build up and maintain your palate.